With the launch of eight Freesat LCD models, Sony joins Panasonic and LG in believing that there are many customers wanting to take the built-in Freesat tuner route. The KDL-40W5810 model boasts 100Hz MotionFlow (the step-up Z series offers 200Hz). There is also a 32-inch model available for those with limited space. Other useful features across all models include Freeview and analogue terrestrial tuners, a Full HD resolution with 1080p/24fps playback for Blu-ray discs, ECO settings and a Bravia Engine 3 image processor. Other delights include Picture Frame (which displays a JPEG image rather than a blank screen in standby) and a limited selection of internet widgets called AppliCast. The set is styled with a 2in-thick piano-black bezel above a discreet speaker grille. Connectivity is good; four HDMIs, component video, digital audio output and an Ethernet socket and an LNB are the headliners. The jury's still out on whether Sony's dual-axis cross media bar (XMB) menu system makes life easier or not, but it's certainly not as intuitive as LG's excellent icon-label combi system. And there's something a bit Kate Moss about the glowing lines used for progress bars and setting volume levels, which are pretty but too thin. The wizard-led installation process makes setup straightforward even if the remote control's layout lacks a dedicated satellite button. Why give a button to analogue TV just because there's a tuner built in? Assuming you've got a dish installed and connected, entering your postcode and tuning into Freesat takes two ticks. To switch to non-Freesat channels you have to do a factory reset and delve back into the menu system. You can enter your own transponder details but there are no pre-programmed lists and and DiSEqC support is limited to LNB switching (1.0 only). Located channels are numbered and added to the satellite list and get a programme banner but no EPG of their own. The Freeview EPG adopts Freesat's seven-day grid and offers basic programme descriptions with a reminder facility. It's rudimentary but neat and legible and although Freesat lets you filter channels by genre, it doesn't have the Freeview guides mini-window that lets you watch the current channel. Picture quality is generally very good. Black levels are amazing for an LCD – almost as profound as LED-lit models. 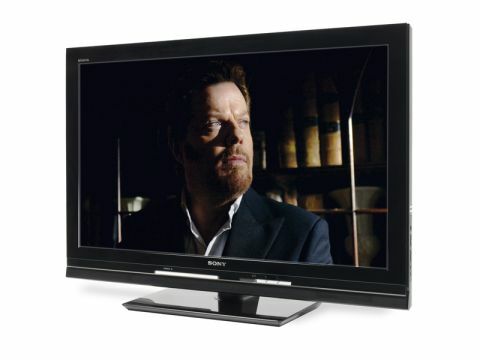 The Bravia Engine does a sterling job with standard-definition sources. HD images from Blu-ray and BBC HD look clear and despite a colour palette that isn't as wide as recent plasma or LED models, skin tones are free of the mottling that occurs on inferior screens. We hooked up a Sky box and tested No Country For Old Men in HD, which was good but not as detailed as we'd expected. Watching films with MotionFlow can make them seem like video, but the mode is useful for sports viewing. Sound-wise, the speakers are fine for daytime TV but too shrill for anything requiring a broader dynamic range, especially at higher volumes.